Had to change the EGR valve in my diesel. Was reviewing a video on how to do this when the guy showed a totally cool ‘tip’ on how to keep bolts (or nuts) in a socket driver. I thought this was so cool I googled it and didn’t see anyone else discuss the tip, so I’ll post it myself. This has been a forever issue for me. I’ve lost more bolts into my engine compartment than I can even remember. Without fail, they lodge somewhere deep where I cannot see them or get them. There must be a Murphy’s Law on this. I’ve got some grabbers that work on tiny parts and my small drivers are usually magnetized, but larger bolts using my 1/4″ tools have always been problematic. 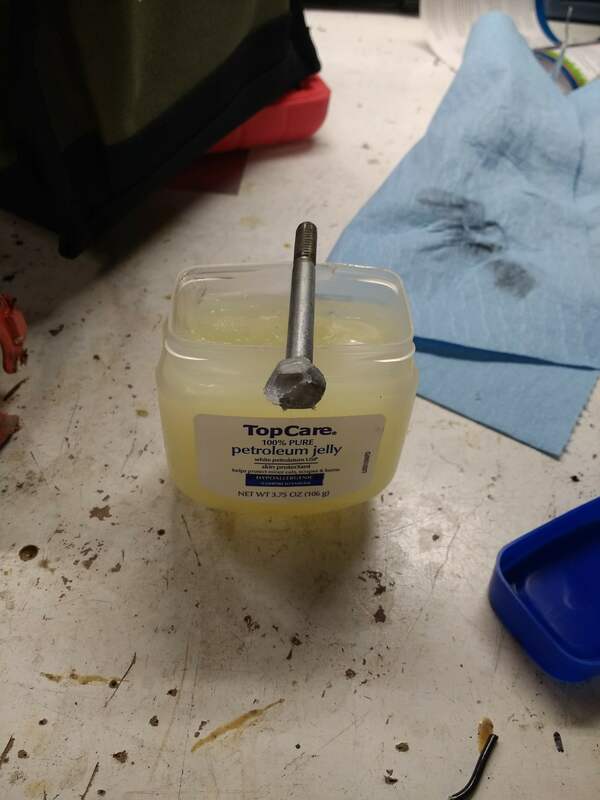 The guy’s tip is super simple: stick the bolt head in petroleum jelly. That will hold it in the socket. If that doesn’t have enough grip, stick the socket in. That should get you some reasonable holding power. This entry was posted in c-Misc and tagged Petroleum Jelly Bolt Holder. Bookmark the permalink. Neat trick, and just in time too, I used it yesterday on the non-magnetic nuts on the floor drier contraption thing.